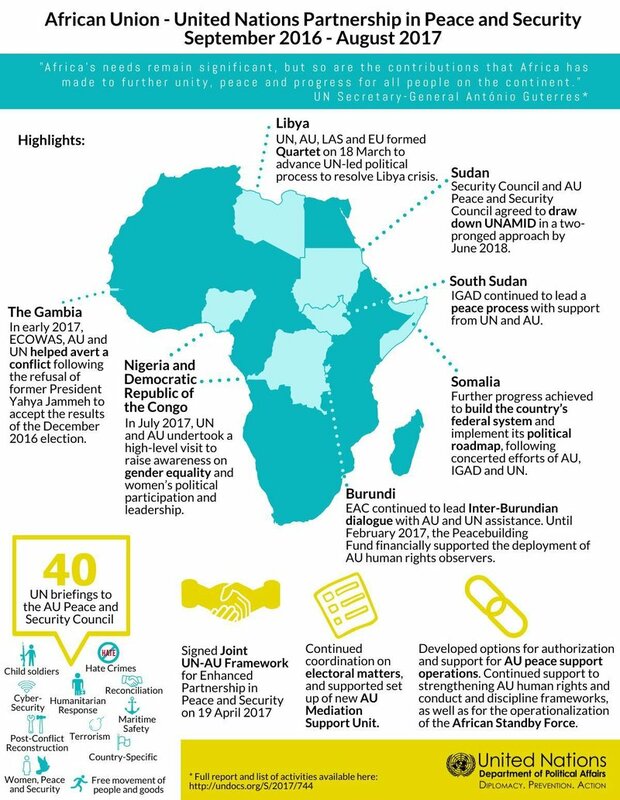 On 19 April 2017, during the first United Nations-African Union Annual Conference, the Secretary-General and Chairperson of the African Union (AU) Commission signed the Joint UN-AU Framework for Enhanced Partnership in Peace and Security. This builds on an increasingly close cooperation since the two Organizations signed the Ten-Year Capacity-Building Programme for the African Union in 2006 (A/61/630). UN support is organized around numerous thematic areas, with the Department of Political and Peacebuilding Affairs (DPPA) leading the cooperation in the area of peace and security. 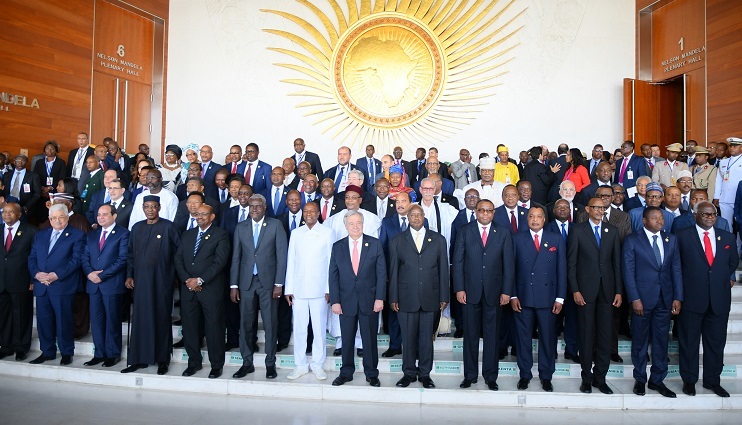 In January 2015, the African Union Assembly endorsed Agenda 2063 which aims at achieving an "integrated, prosperous and peaceful Africa, driven by its own citizens and representing a dynamic force in the global arena". DPPA works closely with the AU Peace and Security Department and the AU Department of Political Affairs to coordinate and support each other’s efforts in conflict prevention, mediation and peacebuilding in line with 2030 Agenda, Agenda 2063 and AU’s peace and security and governance architectures. DPPA strives to align and coordinate the work of the United Nations and the African Union in the area of peace and security so that their efforts become more efficient and effective in Africa. The strategic engagement between the two organizations is evident in the multiple consultative mechanisms on peace and security challenges in Africa, including on early warning, conflict prevention and mediation. The annual joint consultative meeting between members of the UN Security Council and the AU Peace and Security Council: Since 2007, the members of the UN Security Council and the AU Peace and Security Council have held consultative meetings on an annual basis to exchange views on issues of interest to both bodies in the areas of maintenance of international peace and security, especially in Africa. DPPA facilitates cooperation between the members of the two Councils and provides support to their joint activities. In addition, DPPA offers assistance to the Secretariat of the AU Peace and Security Council, building on the Department's own experience in providing support to the UN Security Council, including the establishment of subsidiary organs and building institutional memory. AU-UN Joint Task Force meetings at the senior-level, director-level video conferences and desk-to-desk exchanges: Since 2008, DPPA, DPO and DOS officials maintain constant senior-level interaction (bi-annual Joint Task Force on peace and security) and working-level interaction (monthly director-level videoconferences and annual desk-to-desk meetings) with AU counterparts to assess and discuss political regional developments and responses on the prevention and management of conflicts. The meetings bring together UN and AU officials for information sharing, coordination, and the strengthening of the cooperation. Mediation: Cooperation in mediation entails both institutional and operational efforts. Institutionally, it has comprised the reinforcement of the mediation capacity of the AU Commission, including support for the secretariat and the work of the Panel of the Wise, development of strategic mediation guidance, as well as documentation of mediation experiences and practices through “lessons learned” exercises. Operationally, UN and AU increasingly collaborate to maximize strategic convergence and impact. For example, through its Mediation Support Unit in the Department of Political Affairs, the UN has supported the African Initiative for Peace and Reconciliation in the Central African Republic. The Initiative, led by the AU together with the Economic Community of Central African States and the International Conference of the Great Lakes Region with the support of Angola, the Republic of Congo and Chad, seeks to facilitate a comprehensive peace agreement for the sustainable disarmament, demobilization and reintegration of armed groups in the country. Another example is Sudan, where DPPA continues to support peace efforts led by the AU High-Level Implementation Panel through the deployment of specialized mediation expertise. Electoral assistance: The United Nations provides technical electoral assistance to many of its Member States in Africa, based on their request. Around 50% of the over 70 countries currently receiving UN electoral support are in Africa. In recent years, DPPA has also been increasingly engaged in providing technical and senior-level electoral advice to good offices and mediation efforts in electoral crisis management situations in the continent. In this regard, a senior-level DPPA electoral expert has been deployed to UNOAU to provide more timely and effective support to electoral crisis management situations in the region where UN support is requested. In undertaking the above tasks, DPPA works very closely with the Democracy and Electoral Assistance Unit of the AU Commission (DEAU). DPPA and DEAU are in regular contact to coordinate on country specific issues particularly in electoral crisis management situations. DPPA and DEAU have also strengthened their partnership initiatives in recent years including by increased number of cases where the UN has invited DEAU to participate in the trainings and workshops that the UN organizes including on gender and elections and addressing election-related violence. In 2010, the General Assembly established the United Nations Office to the African Union (UNOAU) to enhance the partnership between the United Nations and the African Union in the area of peace and security, provide coordinated and consistent United Nations advice to the African Union on both long-term capacity-building and short-term operational support, and streamline the United Nations presence in Addis Ababa to be more cost-effective and efficient in delivering United Nations assistance to the African Union (A/64/762). More on UNOAU here.